What is the best way for young children to learn? BY PLAYING. Playing teaches children about the world around them. Play is important for improving speech, language, cognition, motor and social skills. Play based speech therapy uses the context of play to help children reach their speech and language goals. Children respond well to play based therapy because playing is something that they already love to do. It can look less structured because it requires the therapist to change and adjust their activities based on what would be the most beneficial for the child. Therapists use toys as a tool to help them connect with and teach children. For example, with a ball we can work on teaching new vocabulary words (ball, up, down, more), turn taking abilities, attention and early developmental concepts (in/out, up/down, over/under, big/small). It is not the toy that teaches the child, but what we do with the toy. This type of therapy is also something that parents can learn and do with their child. The more a child can play and learn the better! 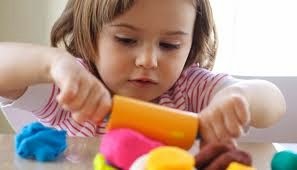 Play-based therapy is considered best practice for children ages 0-3. Additional information is is provided here.